DD5LP/P – April 7th. 2018 – DL/AL-171 Eisenberg. Ever hopeful of some long path contacts into VK/ZL despite the solar conditions and following my last attempt at this summit being rained off a week earlier, I wanted to activate Eisenberg, while at the same time testing the QRP-GUYS tri-bander 20/30/40m loaded vertical which I had rebuilt in its standard form after I had problems with it in my revised 20/40/60m version. During the week before this activation I adjusted and tested the QRP-GUYS antenna at home in the garden and while it still appeared to change resonance depending upon the length of the feeder coax, I went for a simple solution, soldering the coax directly to the antennas switch board, to ensure that the feed length stayed consistent and set up the length of the driven elements and the number of turns on the two toroids to ensure the antenna was resonant on 20m (1.2:1), 30m (2:1) and 40m (2:1). As the most likely band to get long path contacts into VK/ZL is 20m, I would also take along the commercially built 20m end-fed (J-pole) antenna from Lambdahalbe. As I would only be taking my two 6 metre high poles with me, this antenna would be put up in an inverted-L configuration which I had physically tested in the garden some weeks earlier. As I would hope for time to make some contacts on 40 metres and as a comparison for the two other antennas on 20m, I would also take my SOTABeams band hopper linked dipole. I had hoped to have some anti-glare film fitted to the screen of the X108G but unfortunately this only arrived once I had left home and so would need to wait until the next activation for a test. I had however once again packed my SOTA Baseball cap and hoped that would help with shading my eyes so that I could read the display on the X108G in sunlight and with the weather forecast, it looked like I was going to get some sunlight, in fact it looked like being a really nice spring day. Eisenberg is just over an hours drive away from my home along roads that bring me to several SOTA summits and so a well-known route for me. No need to use the GPS Navi for this summit. In the valley there is a village called Eisenberg but I would need to drive through that to the next village call “Zell” and from there the “Berg Strasse” can be driven all the way up to the Schlossbergalm Zell. A wonderful friendly small restaurant with fantastic views and a very convenient car park from where to start the 10-15 minute climb up to the castle ruins on top of Eisenberg. There is actually a second castle ruin on the next hill – called Hohenfreyberg. Although not a SOTA summit (as Eisenberg is on the actual summit), if you have time to visit it, it’s only another 5-10 minutes walk and combining the two castles with lunch at the Schlossbergalm Zell would make a lovely morning out even without the SOTA component. The views are amazing. The restaurant opens at 10am and food is served from 11am every day apart from Monday (except if the Monday is a public holiday – when it is also open). In the winter the (single track) road can be closed but Spring through Autumn this is a lovely place to visit. The drive down went without any problems. On arriving at the Schlossbergalm, I was not-surprisingly, the first car in the car park and one of the owners set off down the track to bring fresh produce up for the restaurant as I was unloading the car. I had thought that I may be able to get to the restaurant and sit outside in the sunshine with a nice cool beer on my way back. Unfortunately I didn’t have time to do that this time. Next time I will as it is a great way to relax after the activation. The track up to the castle is steep, one reason why I decided the week previously that climbing it would not be possible in the pouring rain. Good shoes are required to get up this path especially when carrying two packs as I was. there is a less steep route that goes to the back of the hill, which may be worth investigating but the gate to it was closed and the intention is that the public take the more direct, steep path. So up I slogged, stopping at about half way to enjoy the views. This is a summit I have activated before but I had forgotten how steep the path is. This is as much a problem coming down as going up as the surface is slippery so care is need not to twist an ankle.After about ten minutes I approached the entrance to the castle ruins, emptied my loose change into the collection box which looks like a converted bomb case and noted that the castle is also listed as a museum, making activation of it valid not only for Summits on the air and castles on the air but also for the annual Museums on the Air event. After walking through the centre of the ruins, that have some accessible sheltered rooms, which while being very basic are welcome should the weather turn bad, you come to a large wooden platform that has been built onto the side of the castle ruins and this would be my base for the activation as it gives several mast supports and room to run out the linked dipole wires. There were a few other visitors while I was there but they all kept clear of the antennas and no one asked whet I was doing. When I left around 10am local there were more tourists arriving and the car park was full, so it looks like I chose the right times. in fact that saturday seemed to be the day, the local farmers had decided to repair all the fences and there were several tractors and workers under way as I descended the track back to the car park and the road back down into Zell. But back to the activation itself. as I knew mike 2E0YYY was going to be out and a contact on 40m would be most likely, I put up the linked dipole first of all. Mike soon spotted but I could hear absolutely nothing from him. I put out a “blind call” (i.e. I called him on his frequency hoping he may just be listening and respond to me) – nothing. Conditions are bad! I switched the links in the dipole and spotted myself and put out several CQ calls – no response and the band was really quiet. I tuned around and found Yuri RA3QVQ with his big station (500w and a 10 element beam on 20m!). Of course with that beam and an IC-7300 he came back to me with my 20 watts at a dipole He was 5-9+20dB and he kindly gave me a 5-9. We had a short chat and then moved on. It had been a 200km QSO without me realising it, he was so strong! 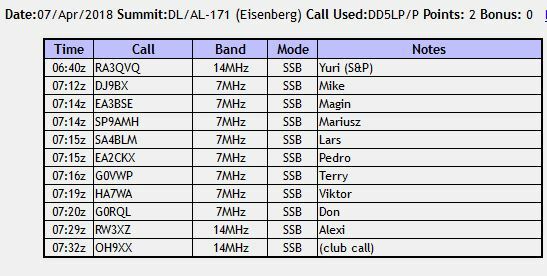 I then saw Mike 2E0YYY spotted again – this time on 20m – I tuned there … nothing, blind-call … nothing. A QSO with Mike wasn’t going to happen today. After several more minutes of calling CQ on 20m and getting no contacts, I decided to try out the QRP-GUYS tri-bander on its fundamental frequency of 14 MHz and while it still seems to receive OK (perhaps 1 or 1.5 S-points down from the dipole), on transmit it was a disaster. Luckily the X-108 has a built-in SWR scan feature and that told me straight away, not to use that antenna any more. Even though it had been set up fine at home, on the summit it had lost resonance – the antenna is simply no good for portable operation while it can be affected by so many things. I also tried out the LambdaHalbe 20m end fed vertical (J-pole) only to find it had a high SWR as well apart from a narrow dip, which was out-of-band! (See notes further down in this article for what I found when I got home). So that was then clear – the only workable antenna was the good old linked dipole which showed 1.5:1 or less on whichever band it was set up for. The journey home was uneventful and I arrived home just after 11am as planned. As is often the case with activations with new or modified equipment, a review is valuable when you get home to see what had caused problems or what can be improved. Rig Display: This was again difficult on this activation with the sunshine however when I arrived home, the anti-glare plastic for Smart phones had arrived and I added this to both my smart phone and the rig display – we’ll see on the next outing if this helps. i suspect the glare will be reduced but the brightness will still need to be increased and so I’ll be looking at the circuit diagram to see what I can do. Putting my SOTA baseball cap on did help visibility of the rig’s display a little and I have ordered a larger brim to try to see if more shade to my eyes will allow me to read the display easier. Rig powering off: On a couple of occasions I caught the power lead and power dropped. Although I checked and re-soldered the cables prior to this activation, it appears still to be a problem. I also starting to suspect that the regulator may be generating RF Noise – so I will need to investigate this before the next activation. Upon investigation, I found the fault – the base of the regulator was able to touch the output socket, shorting the unit out. a liberal application of electricians tape will stop this from happening again (I hope). As for RF noise I did a direct comparison between powering from the battery box with the regulator and running the rig off the shack (linear) power supply – there was no difference. As it was easier to hear stations with my headphones on, I will now turn my attention to the speaker in the X108G which seems a bit lacking in clarity. Depending upon the size, I may be able to exchange it with a better speaker. QRP-Guys Antenna and LambdaHalbe J-Pole tests: Both antennas showed a high VSWR reading on the summit. In the case of the J-pole, it suspected it could be that it doesn’t like being operated as an Inverted-L antenna. I tested the antenna at home on a 10m pole – the result was that in its normal vertical position it was resonant at something like 13.5MHz! I folded back roughly a metre of the vertical element on itself and the antenna is now sub 1.5:1 across the whole 20m band. The antenna is supposed to come cut to length and I believe the 15 & 17m versions of this antenna were correct when they were supplied to me (I’ll re-check them). Willi from Lambdahalbe will be getting an email from me, letting him know he forgot to trim this antenna! The QRP-GUYS tri-bander was tested at home before the activation and had an acceptable VSWR (especially on 20m where it was around 1.2:1 across the band). On the summit it was 6:1 or worse. This antenna design is simply bad. The antennas resonance continues to be affected by external factors that it should not be. I cannot recommend this antenna for portable operation – lucky it was only $15 (plus $15 shipping), I might recover $15 worth of parts out of it. Standard QRP-GUYS tri-band loaded vertical (20, 30 and 40m). SOTABeams Band hopper linked dipole (20,30,40m). This was the first activation this year where the weather was nice to me. Unfortunately the radio conditions were pretty bad. I did manage to qualify the summit and get the two points (no winter bonus now – it’s too late). I did get to test two antennas and the new rig and power supply and found there are still some actions to be completed before this set-up can provide the level of confidence that my old set-up did. I am in fact now carrying less weight however, so that is a move in the right direction.